Redirect in a few steps your website's current RSS feed to the FeedPress feed without losing any subscriber. The creation itself is pretty simple. Go to the feed creation page (you must be identified on FeedPress), and fill the form. If everything goes well, you are then redirected to the administration page of your RSS feed on FeedPress. Take note of the URL you just created, it's like http://feedpress.me/MyCoolWebsite. The goal of this tutorial is to migrate your current feed to FeedPress but also to setup a « whitelabel » system that will allow your users not to see the FeedPress address but the one from your own feed. So, if one day you want to leave FeedPress, you won't need to do a new migration similar to the one you're doing right now. 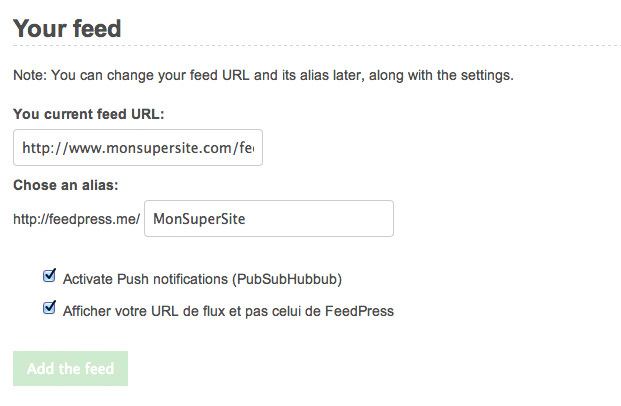 You can install the WordPress FeedPress plugin. Everything is taken care of by the plugin; you won't have to do the hard stuff. Go to our [dedicated page](/support/questions/compatible-tumblr) about Tumblr feed setup. Please note that SquareSpace doesn't support conditional redirection, so you have to make people subscribe to the FeedPress feed URL and not your original URL. More info here. Be careful, put those lines at the beginning of your .htaccess file to be sure that your redirection will correctly work. Please note that ^feed$ can change, here I'm redirecting /feed but if you have to redirect /rss, it will be ^rss$ and so forth. You have to change MyCoolWebsite to your FeedPress feed name as well. Also note that I also leave the access to FeedValidator which is a W3C online validation tool. Your website's feed is now entirely redirected to FeedPress, through your website. You now have the total control of your RSS feed while enjoying the FeedPress services, like statistics, newsletter service or PubSubHubbub management. If you like FeedPress, don't hesitate to share this page with your friends and colleagues.